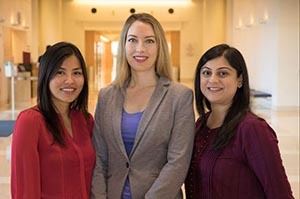 Dr. Claire Baldauf, Dr. Marjorie-Anne Guerra and Dr. Manal Habib have been named as recipients of 2016-17 Harry Winston Fellowships. The Children’s Discovery and Innovation Institute at UCLA UCLA Mattel Children's Hospital announced the fellowships, which support young physician-scientists in their work to prevent, treat and cure pediatric disease and illness. The research fellowships are funded by Harry Winston, Inc., the international fine jeweler and watchmaker, which established the fellowship program in 2014. Candidates for the fellowship must possess a commitment to a career in academic medicine, demonstrate excellence in clinical and research skills, and be motivated to make a significant difference in their field. Candidates must also be pursuing their second or third year of fellowship, a period of specialty training following medical residency. The recipients are chosen annually by an internal committee led by Dr. Sherin Devaskar, the Mattel Executive Endowed Chair of Pediatrics at UCLA Mattel Children’s Hospital and executive director of the UCLA Children's Discovery and Innovation Institute. Baldauf is a third-year fellow in the division of neonatology and developmental biology. Chosen for the second subsequent year as a Harry Winston fellow, she will continue her research on neurodevelopment and fetal brain biology. Baldauf is interested in intra-uterine growth restriction, a serious condition that prevents the fetus from developing and poses a major risk factor for intellectual disability, cerebral palsy and other disorders. She uses a mouse model to study the brain changes that take place and will investigate whether a peptide called humanin, shown to have neuroprotective effects in Alzheimer’s, could rescue the damaged neurons of afflicted babies. She believes that engaging in research deepens the understanding behind clinical decision-making while patient care keeps her focused on questions that require answers to improve health outcomes. Guerra is a second-year fellow in the division of pediatric gastroenterology, hepatology and nutrition. She is interested in identifying biomarkers linked to the infection and rejection of intestinal transplants, which are offered to patients whose own intestines no longer function properly. These patients face the risk of organ rejection as well as infection from the immunosuppressive drugs they take to prevent rejection. Both conditions present similar symptoms, however, and are difficult to diagnose without an invasive procedure. Guerra is working on non-invasive blood tests to help doctors easily distinguish between the two and provide better treatment. Habib is a third-year fellow in the division of pediatric endocrinology. Her research focuses on type-1 diabetes, an autoimmune disease that results in the gradual loss of cells that make insulin. Like Baldauf, she is investigating humanin, a peptide shown to protect the brain in Alzheimer’s disease. She aims to identify an additional function for humanin in insulin secretion and the survival of pancreatic beta cells. Her findings could help expand the treatment options for diabetic patients. “The innovative research led by these young physician-scientists will pave the way for a brighter, healthier future for children worldwide,” said Nayla Hayek, CEO of Harry Winston, Inc.